The cluster contains hundreds of stars, of which only a handful are commonly visible to the unaided eye. 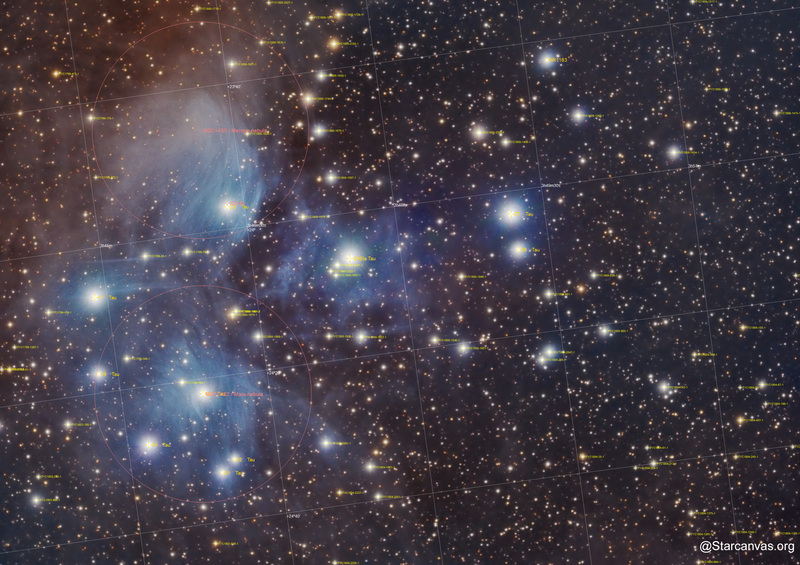 The stars in the Pleiades are thought to have formed together around 100 million years ago, making them 1/50th the age of our sun, and they lie some 130 parsecs (425 light years) away. The cluster is dominated by hot blue and extremely luminous stars that have formed within the last 100 million years. Dust that forms a faint reflection nebulosity around the brightest stars was thought at first to be left over from the formation of the cluster (hence the alternative name Maia Nebula after the star Maia), but is now known to be an unrelated dust cloud in the interstellar medium, through which the stars are currently passing. Field of view ..... 1d 50' 45.1" x 1d 18' 11.3"